As the Felixstowe Book Festival and Southwold Arts Festival commence, we thought we would explore the books that have been written by local authors and are set on our beautiful Suffolk Coast... How do you choose the Top 5 Books in Suffolk? We’ll start our Top 5 with the aptly named The Suffolk Coast by Jon Gibbs. This glossy book is a photographic delight covering the whole stretch of the Suffolk coastline. British landscape photographers are perhaps more often to be found in the Lake District or the Yorkshire Dales rather than England's windswept Suffolk coast. However locals and visitors to increasingly popular resorts such as Southwold and Aldeburgh will know the particular magic of the Suffolk coast. Jon Gibbs’ collection of photographs celebrates the big skies, wide landscapes and coloured beachfront houses of the coast between Corton, near Lowestoft on the Norfolk border all the way down to Felixstowe in the south. Let’s now turn our attention to the wonderfully named Suffolk: Local, Characterful Guides to Britain’s Special Places. This book captures how Suffolk is quintessential East Anglia. Everything from the locally distinctive architectural styles, regional accents, scenery, culture and climate. 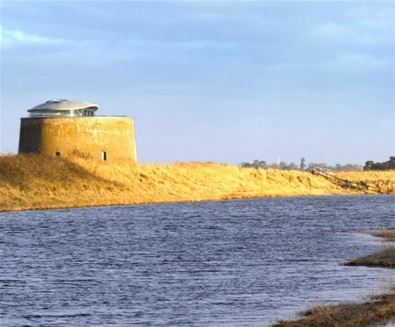 It details that the best scenery is along the Suffolk coast: a soft, dreamy landscape of river estuaries, remote marshes, reed-beds, beaches, shingle banks, sand spits and dunes. And to help you explore why not take a look at 50 Walks in Suffolk, published by The AA. With plenty of five star reviews this book details walks of between 2 and 10 miles. The book feature all the practical detail you need to enjoy a walk on the Suffolk coast and is accompanied by fascinating background reading on the history and wildlife of the area. Each route is colour coded to denote difficulty. All walks have local points of interest and places to stop for refreshments and also have a summary of distance, time, gradient, level of difficulty, type of surface and access, landscape, dog friendliness, parking and public toilets. On to something completely different now. Fans of Charles Dickens will know that David Copperfield was born in the Suffolk village of Blundeston. Although it’s unclear whether Charles Dickens actually visited this historical spot, it still features prominently in this perennial favourite. Situated on the Suffolk coast, just north of Lowestoft, Blundeston is proud of its connections to one of Britain’s most famous authors. And finally, a book that few will know has a connection with Suffolk. Dodie Smith’s 1956 book The Hundred and One Dalmations sees that most villainous character, Cruella De Vil, living at Hell Hall in Suffolk. With help from scores of dogs, Pongo and Missis track down their puppies with good triumphing over evil and Cruella deservedly getting her comeuppance. The Disney cartoon adaptation is a classic and the later two films starring Glenn Close as Cruella are a must for children and the young at heart!